St. Giulia (Julia) Salzano was born on October 13, 1846 in Caserta, Italy. She was the daughter of Adelaide Valentino and Diego Salzano. Her father was a captain in the Lancers of King Ferdinand II of Naples, and he died when Giulia was only four years old. 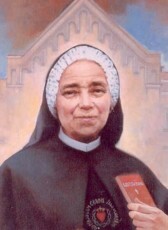 St. Giulia Salzano was raised and educated by the Sisters of Charity in the Royal Orphanage of St. Nicola La Strada until she turned the age of fifteen. She was a schoolteacher and Catechist in Casoria, Naples. She was also a close personal friend and co-worker with saint Caterina Volpicelli. Giulia was a very spiritual person, and practiced her faith devoutly. She was noted for her strong personal devotion to the Virgin Mary, and she did all she could to encourage others in devotion to Our Lady and the Sacred Heart of Jesus. She went on and founded the Congregation of the Catechetical Sisters of the Sacred Heart of Jesus, founded in 1905. She knew the lack of knowledge of the faith in her time, and was devoted to teaching that faith to others. Her heart was drawn to teaching the Catechesis of the Catholic Church, and this was reflected in the Order she founded. St. Giulia said, “While I have any life left in me, I will continue to teach the Catechism. And then, I assure you, I would be very happy to die, teaching the Catechism”. She also said, “The Sister Catechist must be ready, at every moment, to instruct the little ones and the uneducated. She must not count the sacrifices such a ministry demands, indeed, she should desire to die while doing it, if this be God’s will”. St. Giulia Salzano died on May 17, 1929. She died in Casoria, Naples, Italy of natural causes. Pope John Paul II beatified her on April 27, 2003 in Vatican City. In his homily during the beatification he said, “In advance of her time, she was an Apostle of the New Evangelization, in which she combined Apostolic activity with prayer, offered ceaselessly, especially for the conversion of the ‘indifferent’. This new ‘Blessed’ encourages us to persevere in faith and never to lose our confidence in God who does all things. Called to be the Apostles of modern times, may believers also be inspired by Blessed Giulia Salzano to instill in many creatures the immense charity of Christ”. Pope Benedict XVI canonized her on October 17, 2010. During his homily he said, “May the example and intercession of St. Giulia Salzano sustain the Church in her perennial task of announcing Christ and form authentic Christian consciences”. St. Giulia Salzano was born on October 13, 1846 in Caserta, Italy. She was the daughter of Adelaide Valentino and Diego Salzano. St. Giulia Salzano was raised and educated by the Sisters of Charity in the Royal Orphanage of St. Nicola La Strada until she turned the age of fifteen. She was a schoolteacher and Catechist in Casoria, Naples. Giulia was a very spiritual person, and practiced her faith devoutly. She was noted for her strong personal devotion to the Virgin Mary, and she did all she could to encourage others in devotion to Our Lady and the Sacred Heart of Jesus. She went on and founded the Congregation of the Catechetical Sisters of the Sacred Heart of Jesus, founded in 1905. She was praised at her beatification and canonization for being ahead of her time, in the “New Evangelization” – wishing to spend every moment of her life dedicated to teaching the Catechism of the Catholic Church.